1. 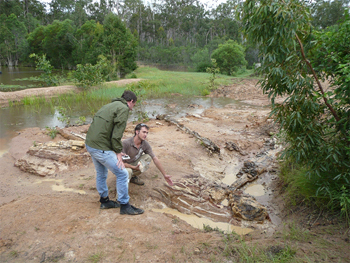 Our Gympie Fossil Flood Logjam Site now has a name: “The Jurassic Ark Project”. 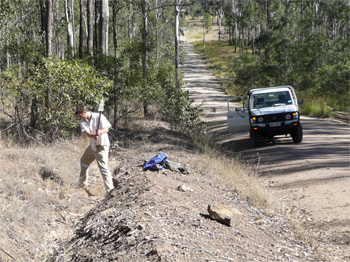 The site is in Jurassic sandstone rocks which are part of Australia’s Tiaro coal measures. 2. For the past 4 years you’ve been watching the Outdoor Creation Fossil Museum grow with greater and greater success. 3. The size of the excavation of this fossil logjam has dramatically increased. 4. 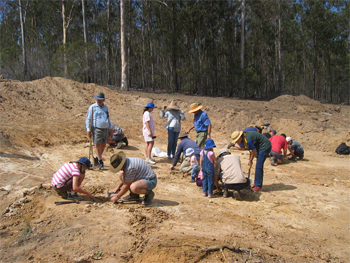 New excavations commenced in February 2008 along with plans to plant a living fossil forest on site so visitors could see identically living plants and fossils as evidence for creation. 5. However, these rocks are regarded today as around 150 million years old. The word “Jurassic” was invented by Creationist, Alexander von Humbolt in 1795 to describe the rocks of the Jura Mountains in southern Germany – nothing to do with evolution or millions of years. 6. 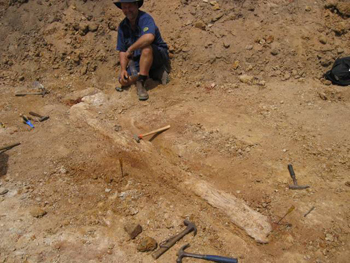 As we excavated, broken petrified logs began to appear buried at all angles, along with some huge cobbles or boulders. 7. A young helper cleans up a section of fossil pine tree. 8. These broken chunks, up to half a metre across and four to five metres long, have obviously been smashed and dumped here. The more we dug, the more obvious it became this was not a fossil forest. 9. The boulders or cobbles were up to 30cm across – a hint about how fast the water was going to carry both the logs and the boulders. 10. Since these broken petrified logs did not grow in this position, then they grew somewhere else. 11. Geologist Liam Fromyhr helps clean newly excavated logs. 12. Further excavation revealed another broken monster. 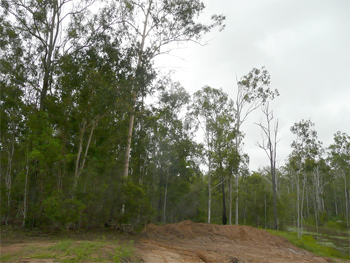 This was a forest that grew somewhere else and has been smashed, demolished, picked up and dumped here by floodwater. 13. 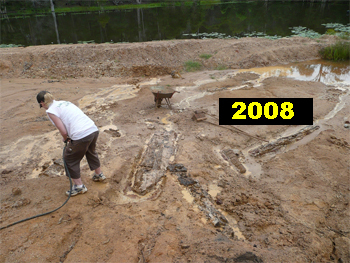 Due to a radical change in climate after 7 years of drought, floodwaters in February 2008 threatened to engulf our new exposures as field assistant John Vuleta and Dr. Diane Eager excavated new finds. 14. The dampened sandstone made it much easier to excavate new logs. 15. This log was definitly shaped by being tumbled and worn by other logs in water. 16. Detailed excavation revealed logs smashed into each other and trees that had been abraded as they floated and tumbled against one another. 17. This log was intriguing because it was only half a log – BUT… 18. It had been split horizontally before it had been buried, almost like a farmer’s split fencepost that’s been petrified. 19. Closeup reveals some of the internal structure of the tree where a branch exited from the trunk. 20. Such detailed structure enabled us to identify it as a Southern Conifer. 21. 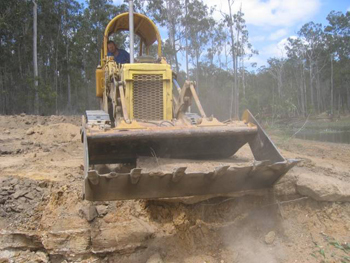 The floods of February 2008 made for a few difficulties with our heavy machinery. 22. A large Australian newspaper sent a reporter. 23. 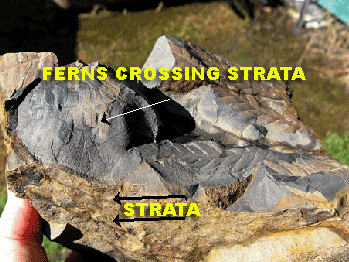 We interviewed Creation Research geologist Liam Fromyhr, as he points out the direction of strata. 24. 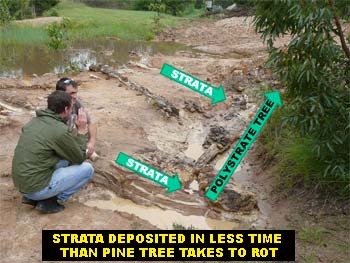 It’s fairly obvious that the strata are going one direction, and the pine logs sit at right angles to this. 25. This phenomena is called polystrate fossil formation. 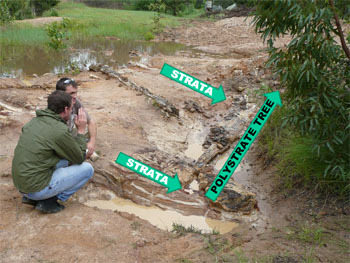 Since these strata are dipping to the north, the petrified log is standing vertically across many strata (ie poly (many) strate (strata). 26. That means the strata were deposited in less time than a pine tree takes to rot. Araucarias are famous for not wanting to have their feet wet at all. 27. The Aussie reporter stated “We are impressed with your evidence, and we will say so” – very pleasing. 28. Liam and John Mackay were exploring further afield on the basis that if our first site was a flood dump, then there should be many other rocks in the region that were also flood dumps, and this included limestone deposits. We went looking for fossil land plants in water-laid limestones. 29. Land plants in limestone were soon discovered at site 2 some 20 kilometers away from our site 1 Jurassic Ark. 30. This fossil fern is tested with HCL acid. The bubbles are a sure indicator of limestone. 31. Tree fern fossils were also found. 32. The fossil fronds are much larger than tree ferns have today. 33. Pine tree leaves began to turn up. 34. Particularly of the Araucaria variety, with scaly stems. Pine trees grow on the land and don’t like wet feet. 35. Do you notice anything interesting about these ferns? 36. They are polystrate fern fossils. They weave across many strata – a sure indicator of flood dumping. 37. 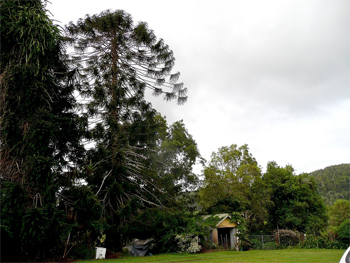 Confirmation from outside experts that our discoveries at Site 1 were Southern Conifers has extended the range of fossils to Hoop, Kauri, Wollemi and Bunya Pines. Wollemi is the living fossil tree which caused a stir a few years back when it was discovered living outside of Sydney, having been thought extinct for vast ages. 38. The range of fossil material found from Site 1 to Site 2 is listed above, and it should be evident that from the time of the deposition of these rocks, up to the present, these plants have not evolved. They have produced their own kind, like God said He created things to do in Genesis. 39. The fossils are also a clue to past climate – Bunya pines, Hoop Pines, Kauri etc today are characterized by a cooller more moist environment. 40. But the region where they are now found as fossils is hotter and drier, characterized by the Australian Gum Tree. 41. 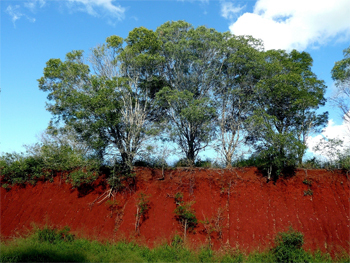 Thick Red soils in the district point to a period of hot, wet climate also. The climate has changed several times and neither man nor motor cars nor factories had anything to do with it. 42. Petrified pines, which are found in many Jurassic Strata in Australia, make beautiful polished slabs. 43. When iron oxides have become mixed with the silica, the beautiful red & yellow colours are really worth seeing. 44. The preserved detail is magnificent. 45. These were only some of the fossil slabs that will form part of the display. 46. At one Jurassic site we have material from, there are Wollemi pine ancestors preserved in yellowish shales. 47. But the land dwelling pine branches are mixed with fossil fish. The fossil fish are usually outlined in white or in yellow, and are very valuable collector’s pieces as this site is now closed to the public. Again, this is a flood dump. 48. We now bring students to this area regularly, to assist in excavation so that they too can learn not only techniques, but experience the thrill of finding something that they are the first people to see since God saw it last. They can also see the evidence of Creation in the fact that these organisms have not evolved, and secondly, they can see the evidence of rapid catastrophic flood dump formation.